Jimbaran - Monday, September 3, 2018, at the Widya Sabha Auditorium Building, Bukit Jimbaran Campus, Udayana University Postgraduate Program began its lectures by conducting inaugural lectures for Masters, Doctoral, PPI and PPDS TA students. 2018/2019. 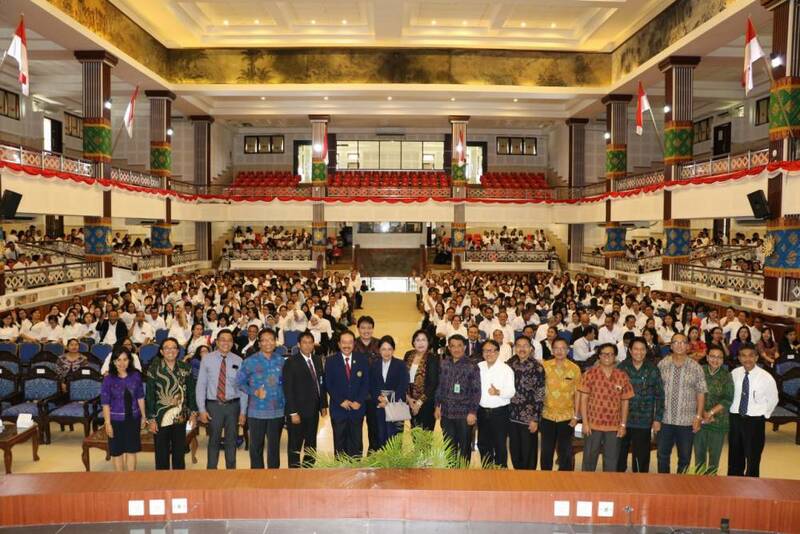 The event which was attended by 1020 students was opened by the Chancellor of Unud, Prof. A.A Raka Sudewi and was attended by the Vice Chancellor I, the Deans, the Post and Wadir Directors, the Chairperson of the Institution, Ka. USDI and the Cooprodi. One of the speakers at the inaugural lecture was the Vice Chancellor of Bali, Tjokorda Oka Artha Ardana Sukawati (Cok Ace) who delivered the theme "The Role of Postgraduate Students in developing Innovations for Bali development continues". Deputy Director of Postgraduate Academic and Student Affairs, Ir. Ida Ayu Astarini, M.Sc., Ph.D in her report conveyed the First Lecture was intended for students who take classes in the Postgraduate Program to get to know Udayana University better, including understanding the vision, mission, goals, process of academic services, facilities available for students, and get to know the leaders at the Rector, Faculty and Study Program level. This inaugural lecture was attended by new students spread across 54 Study Programs in various Faculties managing S2 and S3 Study Programs, with details of students 163 people in the Doctoral Program, 742 people in the Masters Program, 115 people in the Special Doctoral Professional Program and 35 people in the Engineer Prosfession Program. Wadir hoped the speakers present could motivate and inspire students to achieve a better future.